Olly Dog OllyBottle - 600ml - With a size that is more compact than the original, the 600ml OllyDog OllyBottle comes with a bowl that lets you and your dog share water without sharing slobber. Imported. Form-fitting bowl snaps onto the exterior of the water bottle for convenient carrying with minimal added volumeThe OllyDog OllyBottle features a large opening that makes it easy to fill and cleanEastman Tritan plastic is BPA-free and dishwasher safe. Olly Dog OllyBottle - Sporting fun new colors, the OllyDog OllyBottle comes with a bowl that lets you and your dog share water without sharing slobber. Imported. Form-fitting bowl snaps onto the exterior of the water bottle for convenient carrying and with minimal added volumeThe OllyDog OllyBottle features a large opening that makes it easy to fill and cleanMade from durable EastmanTritan plasticEastman Tritan plastic is BPA-free and safe for dishwasher usePatent pending. 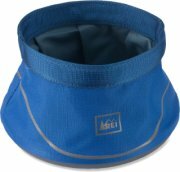 Rei Dog Water Bowl - This REI dog water bowl hydrates thirsty pups. Its generous capacity and intelligent design carry easily when full or collapsed. Imported. Waterproof coated-nylon lining with seamless construction preventss leakage100% post-consumer recycled PET body fabric withstands wear and tearMolded bottom panel and tapered shape keep bowl from easily tipping over and facilitate moving the bowl when fullReflective printing increases visibility at night to help prevent accidental tip oversElastic band on bottom secures empty bowl when it's folded flatInternal stiffener keeps water bowl opening rigid enough for even the thirstiest, big-muzzled mutts to lap from. 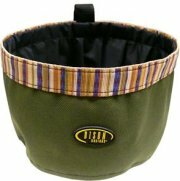 Kurgo Collaps-A-Bowl - The sturdy Kurgo Collaps-A-Bowl lets you pack it, pop it and pour it for your pooch. A 2009 award winner from Dog Fancy magazine, this bowl makes water on the go a cinch. Imported. Made with BPA-free, food-grade silicone, the Collaps-A-Bowl holds 24 fl. oz. Accordion design collapses to an inch thick for easy transport in your car or packPet bowl collapses to a slim .875 inches thick X 6 inches in diameter and expands to 3.5 inches tallHolds up to 24 fluid ounces or 3 cups of pet foodDishwasher safe for easy cleaning at home. Himalayan Dog Chew Large Dog Treat - 3.5 oz. Himalayan Dog Chew Large Dog Treat - 3.5 oz. - Himalayan Dog Chew Large Dog Treat uses an ancient recipe from high in the Himalayas. It is made of yak and cow milk using traditional methods with no chemicals or preservatives. Imported. Hard, long-lasting treat gives dogs something tasty to work on for hours, softening it with their mouths and satisfying their chewing instinctsAll-natural ingredients include yak milk, cow milk, salt and lime juice. Cycle Dog Dog Bowl - The Cycle Dog dog bowl provides your pooch with a convenient and durable dish, while giving old bike tubes new life and keeping them out of the landfill. Made in USA. Post-consumer recycled materials are free of BPA, phthalates, PVC and leadFDA-approved, food-grade lining is leakproof and easy to cleanThe Cycle Dog dog bowl holds up to 22 fl. oz. and folds flat when not in use. 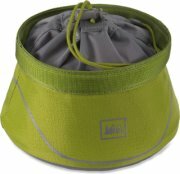 Bison Designs Mess-a-Round Bowl - Gear, specially designed for your favorite hiking and backpacking companion. Pack the Bison Mess A Round 2 Qt. Bowl, for your pooch's meals and drinks on the trail. Polyester construction with PVC coating. Complimentary webbing trim. Machine washable. Assorted colors, sorry, no choice. A great gift ideaA portable food bowl for your petBasic travel dish for pets. Carry loop..
Himalayan Dog Chew Yaky Yam Strength Dog Treats - 4 oz. Himalayan Dog Chew Yaky Yam Strength Dog Treats - 4 oz. - Himalayan Dog Chew Yaky Yam Strength dog treats have protein to supplement your canine companion's diet, helping build muscle in all dogs and produce milk in females nursing a litter. Made in USA. All-natural ingredients also include yak milk, cow milk, brown rice flour, chicken powder and broth, lime juice and saltSpecially formulated to appeal to a dog's primary senses: smoked cheese for smell and sweet potato for taste. Himalayan Dog Chew Small Dog Treats - 3.5 oz. 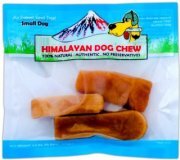 Himalayan Dog Chew Small Dog Treats - 3.5 oz. - Himalayan Dog Chew Small Dog Treats use an ancient recipe from high in the Himalayas. They are made of yak and cow milk using traditional methods with no chemicals or preservatives. Imported. All-natural ingredients include yak milk, cow milk, salt and lime juice. Hard, long-lasting treats give dogs something tasty to work on for hours, softening it with their mouths and satisfying their chewing instincts. Cloud Star Dynamo Dog Functional Treats - Cloud Star Dynamo Dog Functional Treats come in three healthy, fun and tasty formulas to help your dog look and feel its best. Made in USA. Dynamo Dog Functional Treats are grain free, gluten free, contain no corn, wheat, soy, byproducts or artificial flavors, and are always made in the USA of fresh ingredientsIn addition, each formula contains specially selected fruits, vegetables, and herbs.